A branching, usually single-stemmed perennial often found in colonies. Flowerheads terminal on a long stalk with few leaves, small, yellow. Ray flowers few, looking somewhat ragged. Blooms April–June. Leaves mostly basal, rounded to spoon-shaped, toothed, the leaf tissue conspicuously continued into the petiole, to 3½ inches long. Stem leaves few, sessile, often deeply lobed. Similar species: Eight Packera species occur in Missouri, plus a number of hybrids having intermediate characteristics that make identification tricky. Golden ragwort (P. aurea) also has mostly basal leaves, but they are heart-shaped and pointed at the tip, not spoon-shaped. Prairie ragwort (P. plattensis) has mostly basal leaves, but they are shaped like a pointed paddle. It is scattered statewide. Butterweed (P. glabella) lacks basal leaves; its stem leaves are pinnate, deeply lobed, with rounded teeth. 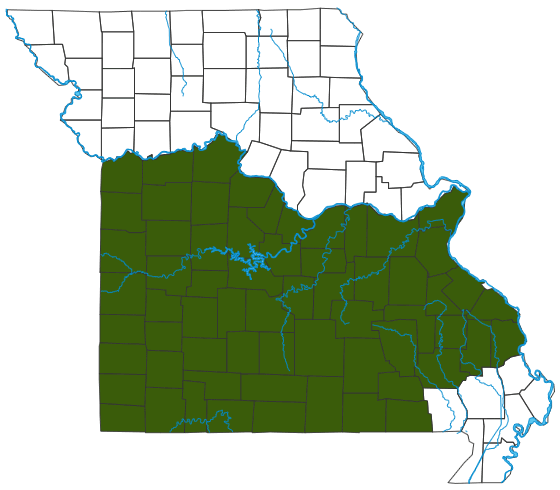 It is found on floodplains of big rivers in southeast and east-central Missouri. Grows in bottomland forests, rich upland forests, banks of streams, ledges of bluffs, and rarely moist depressions of glades and upland prairies; also roadsides and open, disturbed areas. Scattered nearly statewide, mostly south of Missouri River, but apparently absent from the Mississippi Lowlands and portions of the Glaciated Plains. This plant was called “squaw-weed” for many, many years. Linguists debate the shifting meanings and derivations of the word “squaw,” but many people today view it as at least a demeaning, if not deeply offensive term. In its more benign sense of “Native American woman,” the word was often used in names for plants that had historic medicinal uses for illnesses specific to women. This plant is poisonous if eaten, but apparently it also had historic medicinal uses. Such is the case with many plants that contain powerful chemical compounds. Some groundsel species are used in native wildflower gardening. Bees and other insects visit the flowers. The northern metalmark (Calephelis borealis), a butterfly that is critically imperiled in Missouri and threatened wherever it occurs, uses this species as a larval food plant. Because this plant is toxic to eat, most mammals do not eat it.